The largest and most detailed map of New Jersey to appear in the 19th century - a seminal production. Topographical map of the State of New Jersey together with the vicinities of New York and Philadelphia, and with most of the state of Delaware from the State Geological Survey and the U.S. Coast Survey, and from surveys by G. Morgan Hopkins, civil engineer. 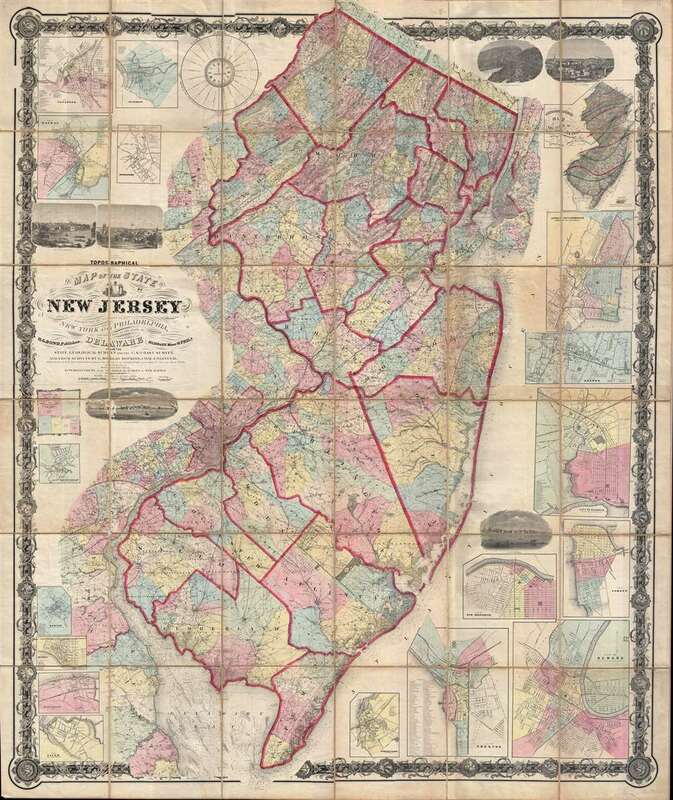 Magnificently detailed, visually stunning, and monumentally proportioned, this is William Kitchell's seminal 1860 case map of New Jersey. Dissected and mounted on thirty-six linen backed panels, this map covers the entire state of New Jersey as well as the Delaware Bay, and adjacent parts of New York, Pennsylvania (particularly Philadelphia), and Delaware. Breathtaking detail is featured throughout. The cartographers truly, mostly with success, attempted to identify every road, hill, farm, hotel, post office, river, creek, swamp, store, distillery . . . and indeed, nearly every non-urban building in the state. In those large cities where marking individuals building proved impossible, detailed insets are presented. The map features seventeen, from upper right: Paterson, Belvidere, Rahway, Morristown, Jersey City and Hoboken, Orange, elizabeth, New Brunswick, Camden, Bordentown, Trenton, Newark, Salem, Burlington, Beverly, Newton, and Mount Holly. Additionally there are several vignette views illustrating New Brunswick, Newark, the Delaware Water Gap, Paterson, Trenton, and Camden. The rivers, bays, and coast lines, especially around New York Harbor and the Delaware Bay, feature countless depth soundings and other nautical references no doubt derived from the work of the U.S. Coast Survey. The whole is surrounded by a grapevine style border further embellished with floral motif decorative medallions. The scale is 1:158,400. Cartographically this map is derived from the earlier work of the State Geological Survey (from work commenced in 1836 under Henry Darwin Rogers), the U.S. Coast Survey (particularly for the Delaware Bay, New York Harbor, the New Jersey coastline, and in various river ways), and further survey work completed by the civil engineer G. Morgan Hopkins under the direction of William Kitchell, superintendent of the Geological Survey of New Jersey. Work on this map began by order of legislature in 1854 when William Kitchell was installed as State Geologist. Kitchell began the work of compiling the map with the assistance of his staff, which included George H. Cook (assistant Geologist), Henry Wurtz (Chemist and Mineralogist), and egbert Viele (Topographical engineer). Two years later, in 1856, the New Jersey legislature, citing financial difficulties, suspended funding of the map abolishing the office of state geologist. Over the subsequent four years Kitchell lobbied furiously for reinstatement and, in 1860, was granted permission to access the 'apparatus and materials belonging to the state survey' in order to, at his own expense, complete his grand map. The result, privately published later that year, is this awesome production, a landmark in the mapping of New Jersey and enormous advancement over the 1828 Gordon map. This map is scarce. The OCLC identifies two examples in the collections of Princeton University and the University of Massachusetts, Amherst. We have further identified examples at the New York State Library, the Fairleigh Dickinson University Library, and the Chester Public Library. There are two further examples in private hands. The present map seems to be the only known example in case rather than wall map format - a feature that greatly enhances its stability and overall state of preservation. A scarce and important map for any serious collection focused on New Jersey. William Kitchell (April 21, 1827 - December 29, 1861) was a geologist and cartographer active in New Jersey during the middle part of the 19th century. Kitchell was born in East Madison, Morris County, New Jersey. He briefly studied at Rutgers College before dropping out to study medicine at the University of New York. He later took a position teaching Natural Sciences at the Newark Institute. Around 1850, finding his calling in this field, Kitchell proceeded to Germany in order to pursue a degree at the Mining School of Freiberg. On his return, in 1854, he was appointed to the office of State Geologist of New Jersey with a commission to produce a geological survey and accompanying topographical map of the state. A failure in legislative appropriations led to the position of State Geologist being abolished in 1860. Kitchell successfully lobbied for a reinstatement of the position and in 1860 was giving permission to continue work, though at his own expense, on his topographical map and geological survey. Later that year Kitchell published his cardinal work, the Topographical Map of New Jersey, arguably the largest and most detailed map of New Jersey ever made. One year later, in 1861, Kitchell unexpectedly died of an unknown acute illness, leaving his assistant, George H. Cook, to continue the Geological Survey, which was finally published in 1868. Very good condition. Dissected and mounted on linen in 36 page sized panels. Original linen backing brittle and worn, especially at fold intersections, but the map itself exhibits no loss and is fine condition. Snyder, J. P., Mapping of New Jersey, p. 105. Dombroski, D. R., 'Brief History of the New Jersey Geological Survey', New Jersey Geological Survey Technical Memorandum, 1984. Barker, H., 'A Brief History of Some New Jersey Maps, 1654-1964', Mapping Digest for New Jersey, Bulletin 66, 1965 (New Jersey Geological Survey), p. 1-2. Cook, G., Annual Report of the State Geologist for the year 1885, (Trenton: New Jersey Geological Survey), p. 162.